At Sonati Hostal Estelí a terrace or patio is featured in certain rooms. There is a 24-hour front desk at the property. 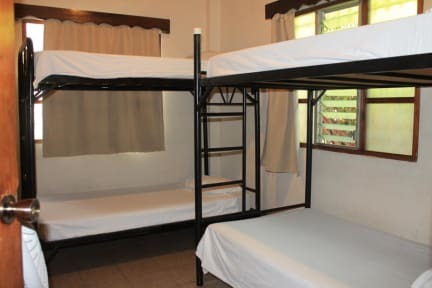 We have two option in accommodation: Dorm and private room with a welcoming and familiar environment. Also we have kitchen free coffee ( 6 am to 12 pm), , book exchange and common areas in a tranquil and beautiful environment, a perfect place to rest!! Sonati Hostal Estelí is located, only 3 ½ Blocks from the Cathedral and Central park. Also One block away to the main road the Pan-American highway in the beautiful city of Estelí, Nicaragua. Near to supermarkets, restaurants, stores and pharmacies, banks and churches. 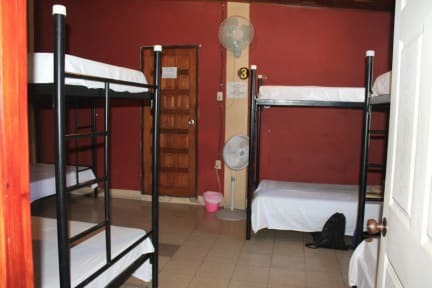 Our dormitories have fan, bathroom (hot water) , small table, clean up every day. The private room are equipped with towels, bathroom (hot water) , small table, cleanup every day. Great friendly and helpful staff. Good location walking distance to bus stations( north & south ) close to supermarket , cool restaurants and bars. Free food coffee in morning. WiFi works really well and great water pressure in showers. Also the beds were very comfortable. Overall great stay wish I could have stayed longer in Esteli and at Sonati. Awesome staff and great people that came in and out of this place. The trips organized out of here are great! Super nice hostel with cozy dorms and common areas. Very nice and helpful staff, I would definitely return! And extra points for the environmental awareness. Perfect place here to go and explore miraflor and somoto! Staff were really helpful arranging our trip and making things as easy as possible. Set up all my excursions through them as well. Very nice helpful staff. Esteli isn’t a big hostel town. I’d say this is the best place! It's a quiet little hostel. Not particularly social but staff answered all the questions I had (tours and bus times) and it was clean. Central city spot and close enough to bus stations. Super friendly and helpful staff. Communal areas lack in atmosphere. We did the Somoto tour provided by the hostel and very much enjoyed it. Hostel was OK, but did'nt have any atmosphere. Showers were warm, which was nice. Would only recommend going to Esteli for the Somoto canyon.